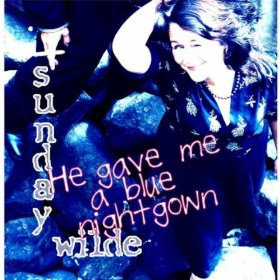 I just received the newest release, He Gave Me A Blue Nightgown, by Sunday Wilde and it's pretty hot! Opening with Down The Road Alone, Wilde plys her captivating vocal style over piano and the equally haunting slide work of David West. Captured Me is a piano boogie under the vocal strength of Wilde. Again West adds a nice touch on guitar. No Matter How Far is a strong vocal track with traces of American Roots. Love Bender is a heartfelt ballad that is appealing on another level. Also adding accordion by Janice Matichuk in an unusual manner adds significant interest on this track. Virgil Denmark also adds texture with violin on this track. There Was A Time is another refreshing track with light accompaniment by Denmark as well Dawson Paulson on percussion. Tell Me To Hush has a distinct period sound that is enchanting. Again the instrumental backing remains light and interesting. I Guess I Didn't Hear You Right is another strong entry. A ballad showing strong melody and creative guitar effects for texture makes this one of the best on this release. Blue Spirit Blues closes the release with an acapella effort. This is the most direct blues track on the release and cluttered with percussive sounds adding to the overall effect of one of the best blues tracks that I have heard from Wilde.